Dr. Hooper, professor Emeritus of Physics, was a respected leader and pioneer in the important field of gravity research. To date he is the only known investigator to have measured the radial electric field around a DC conductor and verified it as having the properties of a motional electric field. 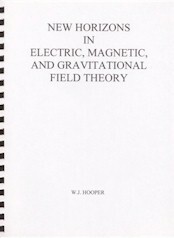 This important material is the essence of over thirty years of experimentation by Dr. Hooper and Electrodynamic Gravity, Inc.
Nearly everyone believes that gravity is a force emanating from matter, but just how, just why, nobody seems to know! In the science of physics much is known about electricity and magnetism, but of gravity, nothing really, with the exception of the inverse square law of Sir Isaac Newton, which we know gravity obeys. This treatise presents newly discovered unique and startling properties of one of our induced electric fields. It gives this field a new status among our field forces. Its unusual properties are possessed only by gravity. While it is too early to claim complete identification of this field and the gravitational field, the similarities are amazingly alike. Electricity and Magnetism were once two separate sciences. In 1820, Hans Christian Oersted observed that magnetic flux was always looped about a current-carrying conductor. This discovery served to unite the two sciences of Electricity and Magnetism into one, that of Electromagnetism. During World War II the writer, working on an invention for a "drift and ground speed meter for aircraft", arrived at a plan for utilizing the vertical component of the earth's magnetic field. If the voltage induced between the ends of two oriented linear conductors traveling horizontally across the vertical component could be measured within an aircraft, a self-contained meter, independent of ground instrumentalities, would be forthcoming. The plan was reviewed by the U.S. Bureau of Standards, and its workability confirmed under a certain restriction. It was stated that the device would be inoperable within a conducting cavity such as a metal-clad aircraft. Our textbbooks have taught us that when a linear conductor moves with a velocity V across a magnetic flux of intensity B, an electric field of vector intensity VxB is induced within the wire and gives rise to a voltage at its terminals. This electromagnetically induced electric field, often called a motional electric field, we have been taught, would be electrostatic in character, that is, identical and indistinguishable from an electric field arising from charges of electricity. We know that radio tubes, silvered on the inside, shield the interior from stray electrostatic fields. In the same way, it was explained, such a drift and ground speed meter within a metal-clad aircraft would be shielded from the electric field induced in a conductor by motion across the vertical component of the earth's magnetic field. This explanation was a jolt to the writer. How could we know, without experimental evidence, that such would be the case? This presented a great challenge! Some of the foremost thinkers in physics were consulted. It was discovered that there was no experimental evidence to support the popular belief held by physicists that the motionally induced V x B field was electrostatic in its fundamental character and therefore subject to shielding. It will be shown how, step by step, the writer has been guided over a period of 20 years to experimental means which at last reveal experimentally, beyond all doubt, the beautiful unique properties of the motional electric field. It is not electrostatic! Its immunity to shielding, magnetic or electrostatic, is the exciting property which it shares with the gravitational field and thereby indicates their kinship. By a general theorem in electric field theory we know that a non-uniform B x V field must also act attractively on matter! Thus the motional electric field has acquired a status which makes it quite unique. Guided by theory the inventor has built a generator of the B x V field which projects its field into the surrounding space. The writer calls this artificially generated field Electrodynamic Gravity because it simulates gravity. Although utilizing principles of magnetic field superposition and electromagnetic induction, the product field, B x V, like the gravitational field displays no evidence that magnetism plays a part in its generation. Likewise it is free of electrostatic characteristics. Although magnetic flux is moved by the generator, there are no mechanically moving parts. The guiding concept employed by the inventor was first set forth in 1957 by E. G. Cullwick (Electromagnetism & Relativity, p. 245, Longsman Green & Co.). His research had led him to the conviction that the magnetic flux loops discovered by Oersted were actually in motion along the linear conductor in the direction of the electron current giving rise to it, and moved with the electron drift velocity. Our motional electric field generator demonstrates the correctness of the foregoing prediction. Its operation makes use of this movement of flux to generate the B x V field in space about the generator. This confirmation of Cullwick's prediction is an experimental contribution to modern electronic theory and it has all the earmarks of being the welding link which ties gravitation to electricity and magnetism. The oersted flux, first its discovery, and now the discovery that it moves with the electron drift velocity giving rise to it, thus holds a unique role in the process of welding the three sciences into one. The new generator affords useful instrumentation for directly measuring electron drift velocities in metals, as well as experimentally determining the number of electrons available at various temperatures. Thus, it provides a new experimental method f investigation into the realm dealt with by the Fermi-Dirac statistics. Theoretically, this device holds exciting possibilities of great utility at very low temperatures. If sufficiently intense fields can be obtained by the use of superconducting wire in our generator at low temperatures, as we have good reason to believe is possible, the phenomenon of attraction and polarization of materials by this field can be studied. This would immediately bring into the realm of possible experimental demonstration such effects as weightlessness, artificial gravity, and anti-gravitational effects. This achievement, the writer believes, will be no more difficult of attainment than that which has already been demonstrated experimentally. Should success follow the forthcoming planned cryogenic (low temperature) experiments and we find that very intense B x V fields can be generated and identified with the gravitational field, the promise of utility to humanity would be beyond all description. Free electric power from the earth's gravitational field would be obtainable anywhere, under the sea, on earth or neighboring space, on the moon or the planets! Gravity-free laboratories on earth, and artificial gravity in spacecraft --- these are some of the possibilities! With such promises on the horizon it is difficult for the writer to rest on his oars for one minute. This treatise therefore goes forth with "Great Expectations!" "The great scientific task of the next 50 years is the development of a new electromagnetic theory. It is impossible to forecast the form such a theory will take, so greatly are we prejudiced by our present views. It will, however, doubtless be based on a quantitative description of the individual behavior of charges"
It is this "something of fundamental physical importance" which is overlooked when the so-called "principle of equivalence" is applied without rigorous examination and analysis. This is the very essence of Bridgman's thesis. There is no evidence that the subject matter of electromagnetism, since its earliest inception, has ever been given the Bridgman treatment. If we desire to keep our future growth on solid scientific ground, we are faced with the necessity of review and revision of old and new concepts which dominate thinking in the direction of its inevitable expansion. We need much to learn how "greatly are we prejudiced by our present views". In order to make way for the next great breakthrough in physics we must first come face to face with facts that reveal how greatly our present concept of fields is restricting our thinking and limiting our achievements. It will be shown with experimental and theoretical proof that this assumed and prejudiced view is incorrect. Indeed, it is as obsolete as the concept of the atom as being a single indivisible particle, and as obsolete as the concept of a single atom for each element. It is as unrealistic as were the arguments of the famous Professor Simon Newcomb, recipient of honorary degrees from ten European and seven American universities, who was demonstrating mathematically that man could not fly, while the Wright brothers were assembling their aircraft at Kitty hawk. Simply because it can be shown mathematically that an electrified particle will trace identical trajectories in each of two types of fields, is no proof that these fields, these accelerating agencies, are equivalent and identical. Penetrating properties of fields, rendering them immune to shielding, possessed by some and not by others, have no mathematical representation in such so-called proofs, hence the proof is not rigorous because it does not include all the field properties. By combining two conceptual prejudices, "one electric field" (or its equivalent, electric charges only) and "no magnetic field", Moon and Spencer have produced what they call "A New Electrodynamics" (7 ~ J. Franklin Inst. vol. 257: p. 369, 1954) which appears on the surface to have revamped the whole picture of electromagnetism, in which no reference is made of fields, and the formulation is in terms of charges and their motions only. It would appear upon first examination that the success of their endeavors would constitute a basis for establishing the verity of the two basic assumptions. But this is not the case, as will be shown. The Bridgman treatment of Maxwell's equations clarifies the paradoxes and ambiguities previously associated with them and in so doing it retains the intrinsic values found in electric and magnetic field concepts ( 8 ~ P. Moon & D.E. Spence: "Some Electromagnetic Paradoxes", J. Franklin Inst., vol, 260, p. 373, 1955). Both the Maxwell equations and the "New Electrodynamics" formulation take on new meanings when analyzed in the light of the Operational Viewpoint urged by Bridgman. We will go into this subject in the next chapter. Wile Moon and Spencer claim that the complete elimination of all reference to electric and magnetic field concepts in their formulation brings it to "a closer contact with reality", to the writer, this constitutes rather a fleeing from the reality of fields by burying one's head in sand, like an ostrich, wherein only sand particles can be seen, and one's body remains in a variety of teeming dynamic forces. The concept of electric and magnetic fields possessing intensities and directions, susceptible to direct experimental measurement and mapping, is one of the most fundamental and elemental realities of electromagnetism. True it is that perplexing and incongruous problems in field theory, heretofor seemingly unsolvable, have plagued it, and indeed these problems are largely responsible for the current trend to avoid field theory, especially magnetic, wherever possible. It is right in this area that Bridgman's Operational Philosophy comes to our rescue and affords a solution which is both satisfying and illuminating. Electric and magnetic fields are manifestation of force, and force is always associated with energy. Our understanding of the energy nature of electric and magnetic fields up to the present time appears clouded and uncertain. A clear adequate description has not been found by the writer in any contemporary text. In place thereof is found confusion worse confounded. In order to fully comprehend the significance of this treatise we must have some acquaintance with the present status of our knowledge of fields, both energy-wise and otherwise. A glimpse of this state of affairs may be gained from a few quotations from The Electromagnetic Field (10 ~ Mason & Weaver, op. cit., pp. 266-269). Speaking of the special density of electric and magnetic energy and of the Poynting Vector which measures the flux of energy at any point, we read: "The authors do not pretend to understand these concepts, but discuss them as adequately as they are able". They further say that they "are not able to ascribe any significance whatever to the phrase 'localized energy'". Nothwithstanding these views, they state, "The hypothesis of a spacially distributed electrostatic energy of volume density ha, however, played a large role in the development of electromagnetic theory" (11 ~ ibid., p. 162). And again, "in both electrostatics and magnetostatics, energy densities in space have, to be sure, been calculated" (12 ~ ibid., p. 269). It is an object of this treatise to completely clarify this area of electric and magnetic field energy. Energy, in the many forms it assumes, appears today to play a leading role in the great drama of physical science. Whether it is kinetic or potential, mechanical, electric, magnetic, electromagnetic, binding energy of nuclear structure, or any other of its myriad manifestation, it is some form of energy, pure or bottled up in particle form, which we encounter and cognize at every turn in this physical world. Everything in the material universe is some form or manifestation of energy. In the light of fundamentals it would seem most natural that a proper scientific description and classification of anything would include terms which reveal its energy nature, or status with respect to energy. In a comparison of one thing with another, one recognizes as a mere self-evident truism the fact that for any two things to be identical in nature, they must necessarily be identical from an energy standpoint, and this truism especially applies to force fields, both electric and magnetic. This treatise will especially concern itself with one of the most important underlying properties of one of our electric fields, the "motional electric field B x V" and its immunity to shielding. It will present new theoretical and experimental knowledge which must have consequences of vital importance to the science and philosophy of modern physics. The picture presented will be based entirely upon conceptions of electromagnetic theory which are found in complete agreement with experiment. This picture, it is believed, will reveal not only the cause of many of our difficulties, but the way out of them. It will reveal a vista of new opportunities for research. It is confidently believed that as a result of the clarified picture thus attained, new horizons in field theory are in the offing. A glimpse of these horizons, together with an electromagnetic theory of gravitation leading up to the derivation of Newton's Inverse Square Law, will be presented with experimental proposals for its verification. Finally the subject of antigravity will be discussed and, in the light of this thesis, how a practical approach to this problem is clearly indicated with its thrilling possibilities.